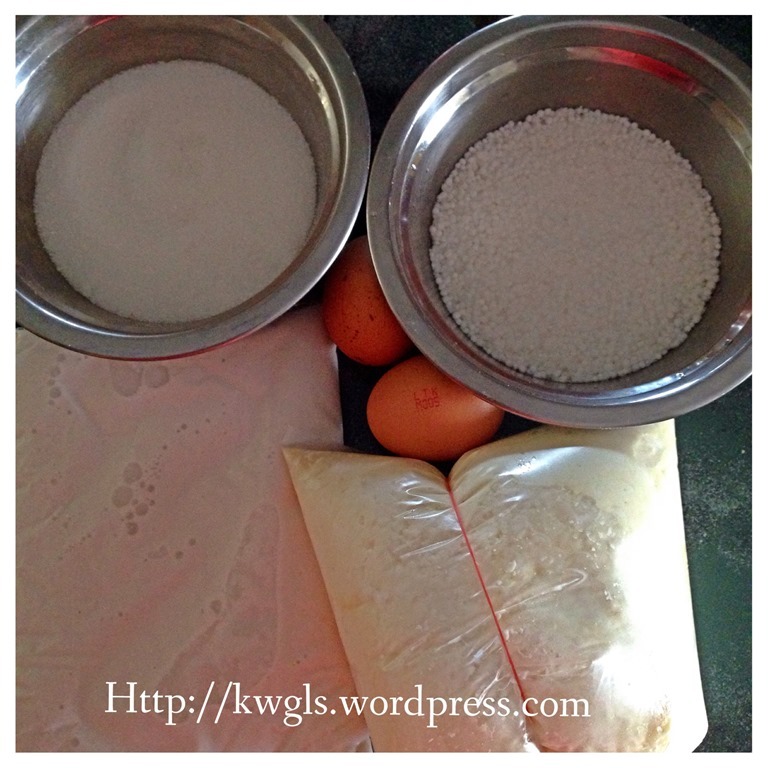 This post was updated with recipe 2 of which there is no eggs and coconut milk added . The colour will be slightly yellowish and translucent as compared to the first set of pictures with eggs and coconut milk. Taste will not be as aromatic but it is softer as no eggs is used to set the cake. Therefore, rolling with shredded coconut is required for recipe 2 . 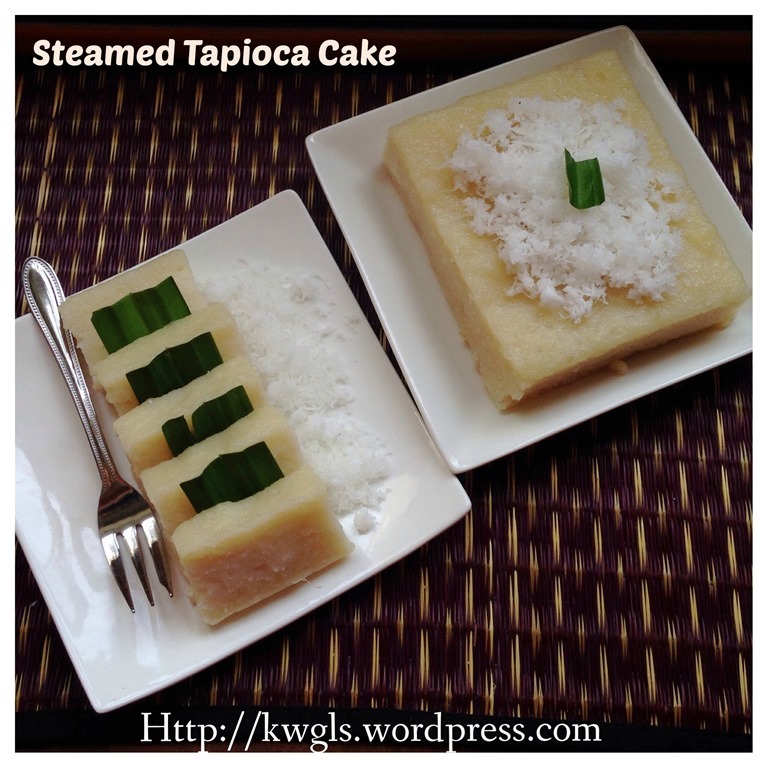 My late mum seldom prepared traditional Nonya cakes (kuih) except two, one was tapioca kuih and another was kuih lapis. 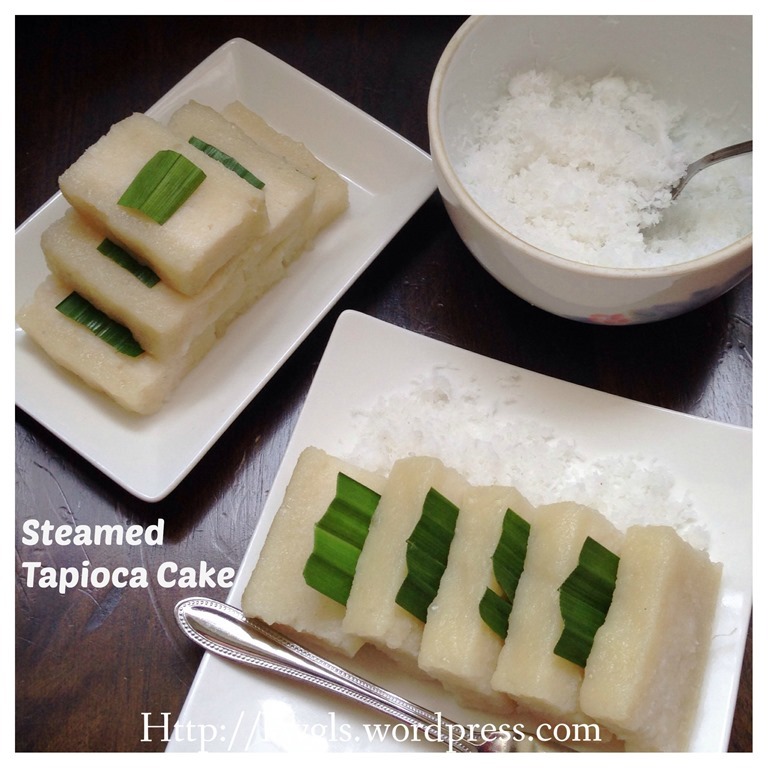 I missed her steamed tapioca cakes. 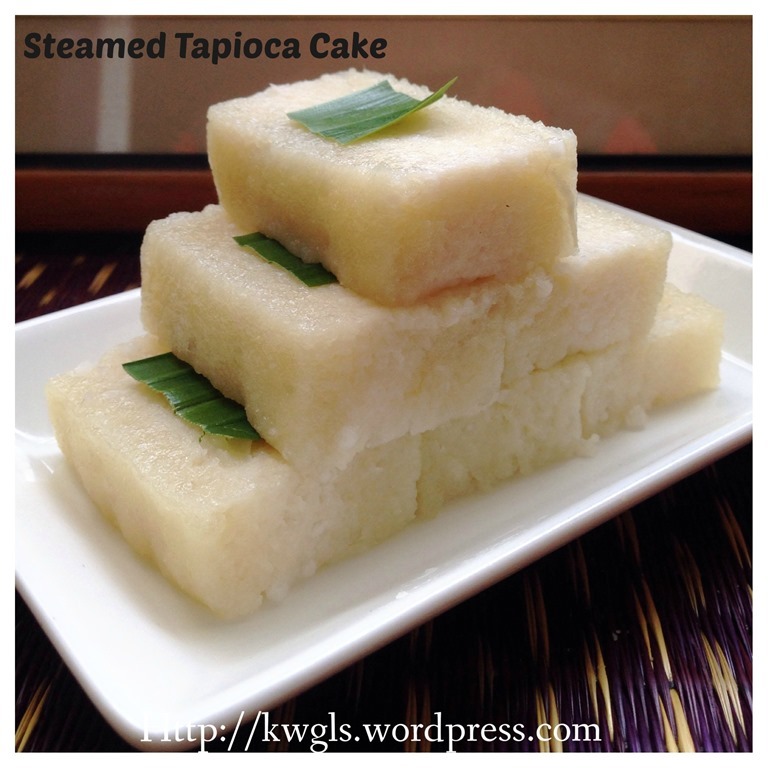 I can vividly remember the kuih that she had prepared, a white or rather beige colour. 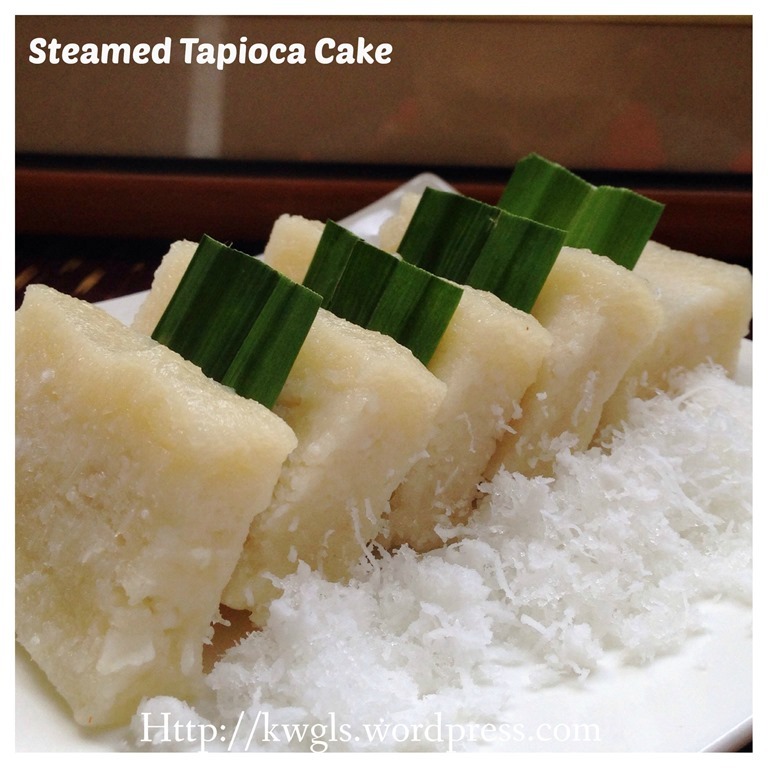 sticky type of steamed cake. It is full of coconut aroma and is soft and very easy to eat. However, what is sold in the stores are rather different (updated with recipe 2). Most are translucent and some are baked version with lots of butter . I have therefore decided to replicate what I have eaten. It will definitely not difficult as I am well aware that all traditional recipes will be simple. In fact, what my mum did were all estimates (agak agak in Malay). She prepared the cake based on her estimation and like many other families, she had never passed down the recipe to us. This is a simple recipe and in facet, all traditional recipes are simple. 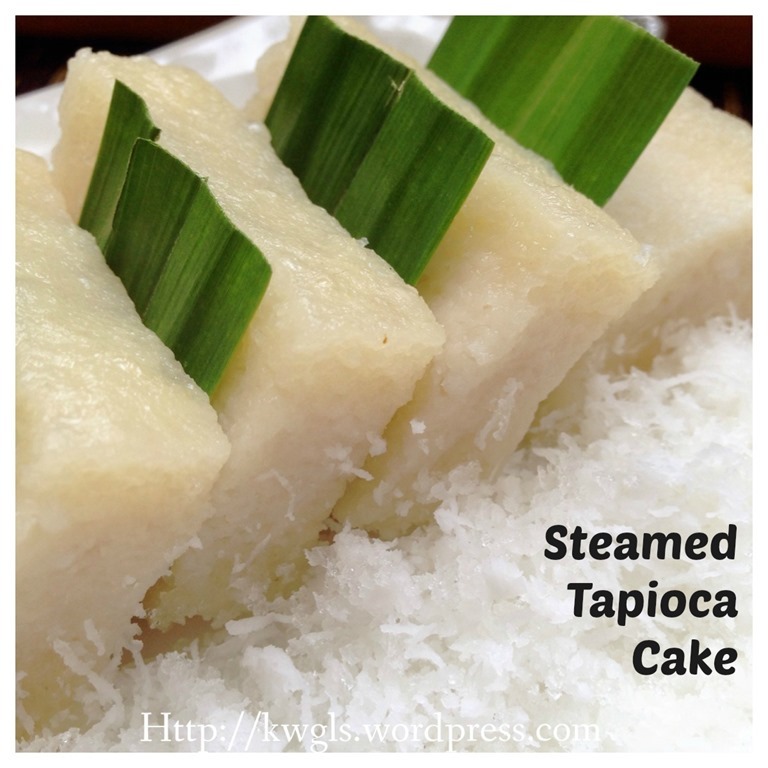 I have opted to buy the ready grated tapioca in Singapore’s Geylang Serai wet market but I remember during my mom’s time, we planted our own tapioca and grated our own tapioca or even coconut when we want to prepare the cake. 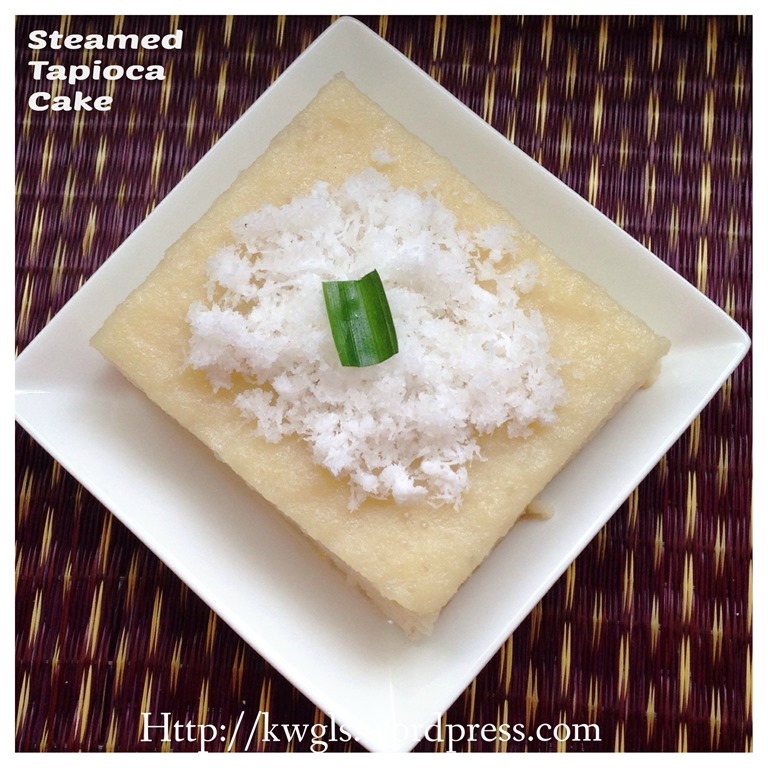 Of course you can easily grate your own tapioca by putting it in a food processor. 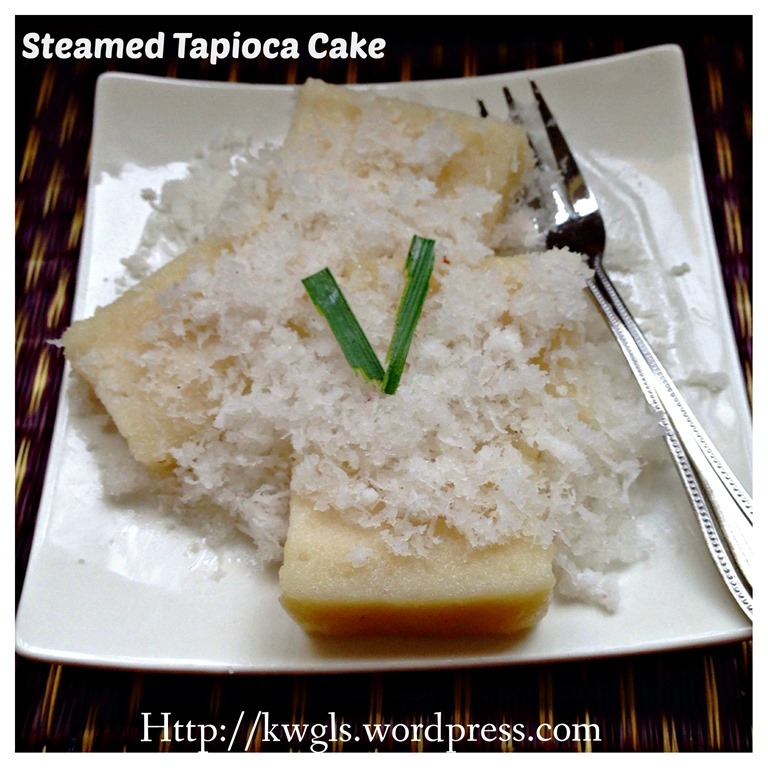 I have modified the recipe with the inclusion of one cup of sago balls. The inclusion of the sago balls is to better improve the texture. The sago balls will need to be soaked and best be blend together with the tapioca to get an better finer texture. However it was considered as optional. 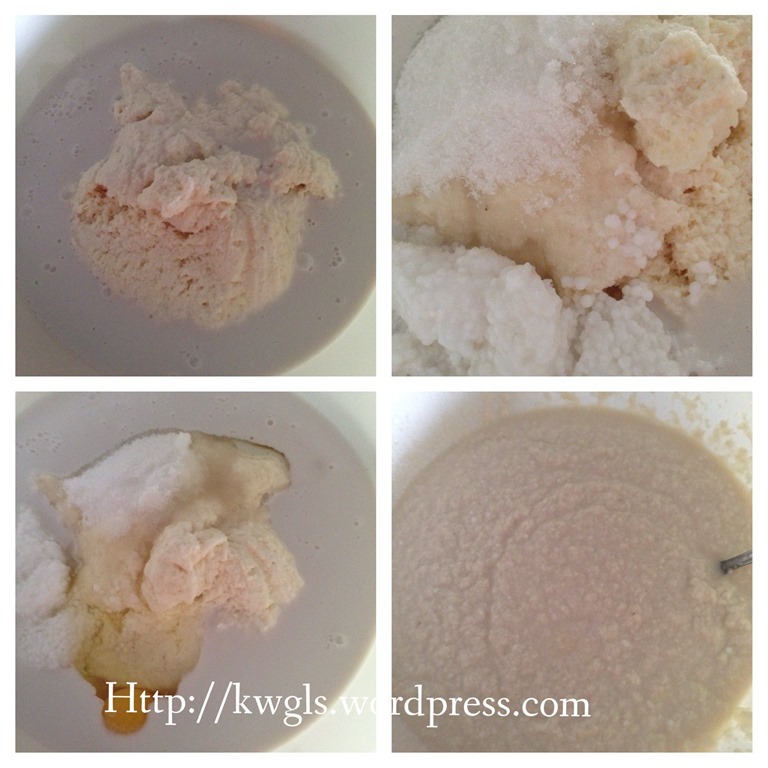 If you do not put eggs, the output will be beige colour but translucent. 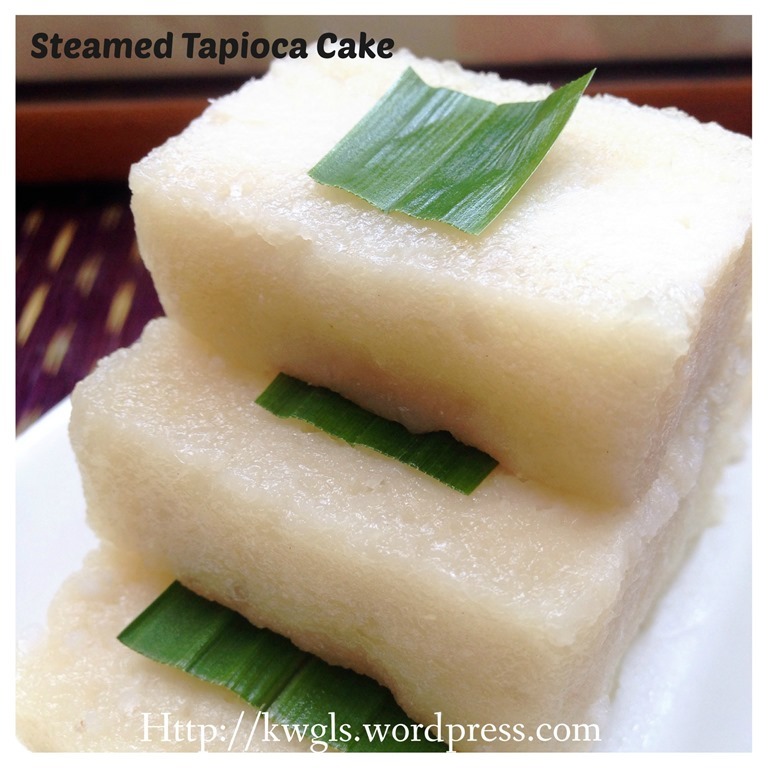 Depending on the species of tapioca that you have used, Some tapioca are lighter in colour and some are yellowish. If you cannot buy the grated tapioca, just put all the ingredients in the blender, blend until fine. If it is too rough, you can use food processor to blend small first before transfer to the blender. Lightly greased a round baking tin and get ready a steamer able to steam the cake for about 25-30 minutes. Put all ingredients in a big mixing bowl and stir well mixed. In this illustration, I have use the simple mixing method but I would advise that, if possible, use a food processor instead. 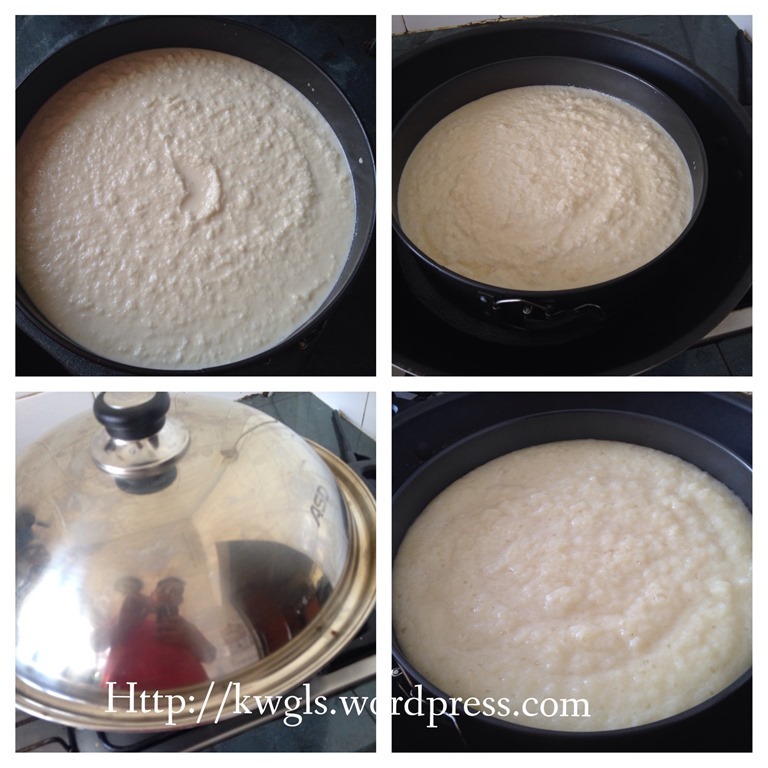 The food processor are able to further refine the batter and ensure it is well mixed thus give the cake with a better texture. Transfer to a lightly greased baking tin and steam under high heat in a steamer for at least 25-30 minutes or until a skewer inserted comes out clean. The steaming time will depends on the size of the your baking tin used. It is best the skewer test be done on separate places in the cake especially the centre. Ensure there are enough water throughout the steaming period. Cool completely (possibly in 1-2 hours) before cutting with a greased serrated knife. Nothing much to conclude. 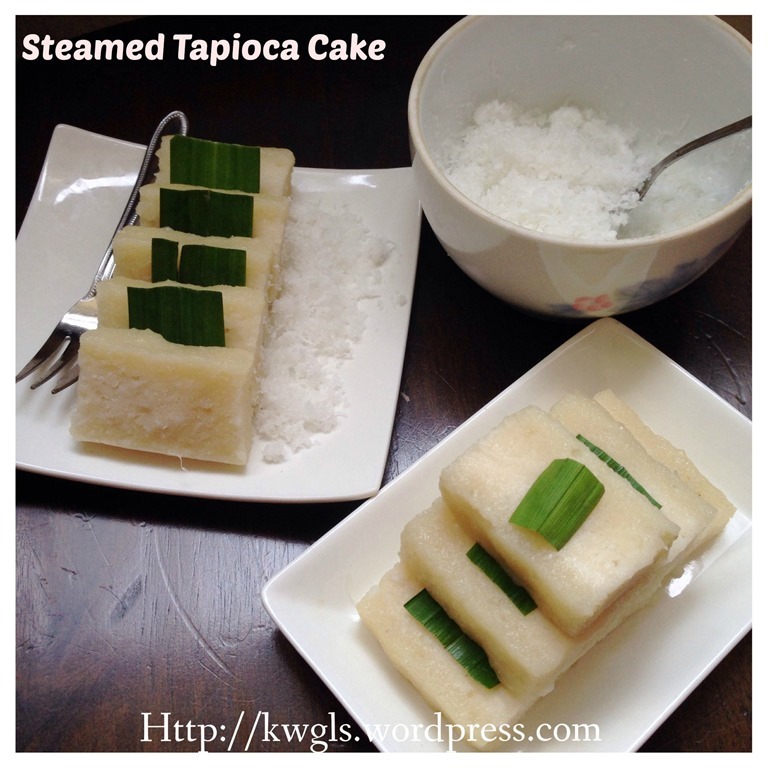 It is a simple traditional recipe and I like the cake for its simplicity in taste and its soft texture. 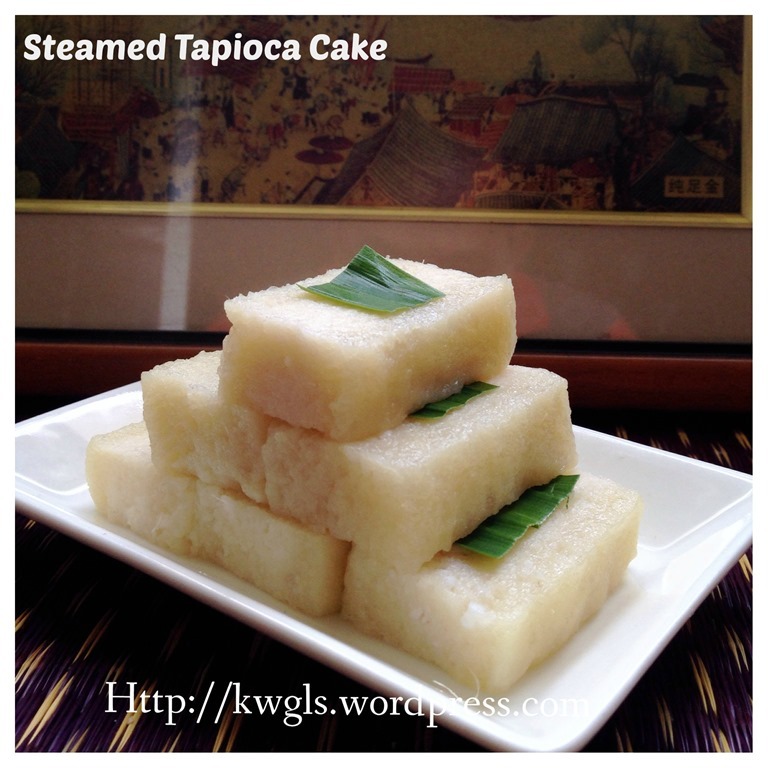 This entry was posted in Chinese and Asian Cakes and Snacks, Food Preparation Series and tagged 8, GUAI SHU SHU, Guaishushu, kenneth goh, Kueh Ubi Kayu, Kuih Ubi Kayu, postaday, Steamed Tapioca Cake, 木薯蒸糕. Bookmark the permalink. Thanks! Oh, tried making…it is really yummy and reminds me of home!! Thank you so much for sharing! !